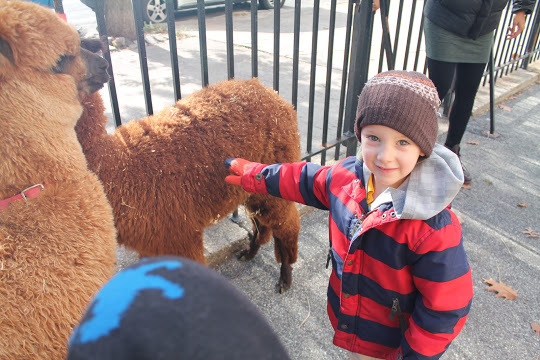 A petting zoo visits Brighter Choice Community School in Bed-Stuy. Got a 4-year-old? Applications for free pre-kindergarten are due March 30! This week, we're bringing you the best bets in Brooklyn, Queens and Staten Island, based on our visits and intel on schools most likely to have space. See our Pre-K guide to learn how to apply and to search by address for all Pre-K programs in your neighborhood. Read What to look for and Your options to learn more. In District 13, in the DUMBO–Vinegar Hill area, PS 307 has a STEM magnet grant and a Mandarin Chinese teacher. The sparkling new pre-k center at Dock Street has 72 seats. Many small neighborhood schools in District 14 have expanded pre-k offerings and are worth a look. PS 120 has a robust arts program and established pre-k classrooms. PS 157 strikes a balance between play and reading, writing and math, according to a parent. Small, safe PS 319 serves only pre-k through 1st grade, so teachers have honed their expertise in early childhood education. Another good bet is diverse, well-run PS 132, which took some in-district kids after taking siblings last year, as did PS 31 and PS 34. District 15 covers many neighborhoods, but only a few public schools have pre-k slots available. We found three that are good bets. In Red Hook, PS 15 has a dual-language—Spanish-English—class in pre-k, a rarity for this age group. In Park Slope, PS 133 is a lottery school that offers Spanish and French dual-language programs. Priority goes to low-income students and those learning to speak English. Boerum Hill parents praise the pre-k program at PS 38, a spacious building with large, airy classrooms and entire rooms for block and LEGO play, plus a new STEM lab. There are seven classrooms and class size is small. District 15 is also home to several pre-k centers. Confusingly, they share the same name: The Little Brooklyn Pre-K Center. The one at 173-177 25th Street has Spanish-English and Chinese-English dual-language programs. We liked the one on Third Avenue in Gowanus, in a snazzy, renovated former glass warehouse. Trips and activities are features of all the Little Brooklyn Pre-K Centers; children study hermit crabs, grow lima beans and make their own recycling containers out of boxes and paint. And we loved the joyful discovery-based pre-k center at Bishop Ford, where kids go on expeditions and bring back questions about trees and street signs and raccoons. In District 16, academics begin early at Brooklyn Brownstone School, with its no-nonsense atmosphere, high expectations and involved parents. PS 21, one of the highest-performing schools in the district, had many seats available for kids outside its zone. Pre-k classrooms are lively and inviting at Brighter Choice, a school that has attracted parents from the Bed-Stuy Parents Committee, who are working with the district to improve neighborhood schools. In District 17's Prospect Heights, the pre-k classrooms at PS 138 have dramatic play corners, academics and experienced teachers. The PS 241 program has its own early childhood mini building, behind a renovated playground. New Bridges Elementary in Crown Heights has five pre-k classrooms "bursting with tools and toys," according to our reviewer. Arts are a big focus at the school. PS 375, also in Crown Heights, has a principal who favors the Reggio Emilia Approach, which encourages exploration and discovery. In East Flatbush, we liked PS 770 New American Academy, an innovative model that draws inspiration from the open classrooms of the 1970s. Only a handful of public schools had openings for pre-k after accommodating siblings and zoned applicants in District 18. Of those, PS 233 is a good bet, with some of the highest teacher satisfaction ratings in the district. There are no pre-k centers here, unfortunately. One of the most respected Head Start programs in Brooklyn is in District 19. Cypress Hills Child Care Center has a joyful environment and teachers who love their work and stay for years. The program is accredited by the National Association for the Education of Young Children (NAEYC)—a sign of high quality. On our visit, we saw happy children building with blocks, splashing at a water table, or singing and dancing as their teachers encouraged them to talk about their projects. Low-income families have preference in admission; there may be a waitlist, however. Southern Brooklyn's District 20 boasts many great neighborhood schools, but there is severe overcrowding. The DOE has added nine pre-k centers, most of which had empty seats last year. (Tip: Type “District 20 Pre-K Center” into our school search and they’ll all pop up in a row.) The pre-k quality snapshots for these centers look fine. If your child speaks Italian or wants to learn it, the Italian-English dual-language program at PS 112 in Bensonhurst begins in pre-k. Also recommended: Happy Dragon of New York, Inc. The center serves mostly children who speak Cantonese or Mandarin, and it does a good job hiring teachers and teaches children to be independent, Schools Chancellor Carmen Fariña said after visiting. Our pick in southern Brooklyn's District 21 is diverse, safe PS 212, which had room for some children in the district who were not siblings of older students last year. There are four pre-k centers, all called Brooklyn's Daily Discovery Pre-K Center followed by the center's address. Quality snapshots are positive. In District 22, schools vary greatly from one end of the district to another. The northernmost schools tend to fill with zoned students. Several schools have expanded in the southern areas, and you can try getting on a waitlist. The Joan Snow Pre-K Center has three pre-k centers at different addresses. Riverdale Avenue Community School is located in tiny, unzoned District 23. It has lively pre-kindergartens with art, hatching chicks and block-building. Our “What to look for in a pre-kindergarten program” video was filmed at the excellent, nurturing FirstStepNYC @ PS/IS 41 (also listed under SCO Family of Services). Bushwick United Head Start 1 in District 32 has eight classrooms, plus a 3s program and accreditation from the National Association for the Education of Young Children (NAEYC), typically a sign of high quality. The website has photos of children poring over subway maps, singing to guitar music, and building with blocks and Lincoln Logs. In District 24, most neighborhood school pre-kindergarten seats fill up with siblings and children living in the school zone. The DOE has opened 18 pre-k centers to alleviate crowding, all under the name Mosaic Pre-K Center followed by the center’s address. Find links with address, phone numbers and maps showing locations here. As noted, pre-k centers are a good alternative to crowded neighborhood schools. District 25 has many good, zoned schools, but the competition for pre-k is fierce. PS 201 has four pre-k classrooms and a magnet program in inquiry and research. The Active Learning Elementary School has a rare all-vegetarian menu for lunch. It's open district-wide and last year had some space for non-siblings. Enrollment is tight in District 26 in northeast Queens, long the city's highest-achieving district. Most public school pre-k seats fill from within the zone only. The Lutheran Schools of Flushing and Bayside was voted “Best of the Boro,” by Queens Courier in 2015. Hey, Bayside parents: Weigh in with your picks! On the farthest seashores of Far Rockaway, in District 27, our pick is Queens Explorers Elementary School PS 316, which has an innovative leader, a hydroponics lab and a math lab where kids get to combine movement with mathematics. Overcrowding is a problem in schools across District 28. PS 160, which we visited in 2015, is improving under Principal Tiffany Hicks, who has added more arts programs and stronger social studies. The pre-k classes are in cramped but tidy portables, and kids have easy access to a safe playground with sparkling climbing equipment right outside the door. You may also want to look at the new pre-k centers in the area. In District 29, we recommend PS 176, a well-run neighborhood school that had space for out-of-zone students in recent years. Also take a look at the pre-k centers on Jamaica Avenue and Springfield Boulevard. Zoned schools in District 30 are crowded and many do not offer pre-kindergarten. PS 112 in Long Island City is an option: It has five pre-k classes, is racially diverse and boasts good attendance. PS 85 has 72 pre-k slots, and there are six District 30 pre-k centers. PS 53 had some seats after taking siblings last year. It gets high marks from both teachers and parents on the annual school surveys. Also check out the three Richmond Hill Pre-K centers, which get high marks from the city. Have more questions? Reach the Pre-K for All outreach team at the DOE: (212) 637-8000. They are offering one-on-one help, but be prepared to wait. This list is only a start. Give a shout out to great programs you know about in the comments!